Midway through the fourth quarter last night, it looked as if the Bucks might pull off a nifty comeback and force a Game 7 after being down by double digits for much of the second half. They did not. Milwaukee was down by 13 at the half, but it seemed like even more after a demoralizing second quarter in which they scored only 14 points. Midway through the third, they were down by 25. But they mounted a comeback throughout the fourth, and the Bucks took their first second-half lead on a Jason Terry three-pointer with three minutes left to play. The Raptors snatched that lead right back on a 9-0 run—with a sequence featuring dunks by Patrick Patterson and DeMar DeRozan plus a Cory Joseph three-pointer, while the Bucks missed five shots in a row. Milwaukee had a chance to make up for that beginning with a very silly Serge Ibaka three-point shooting foul on Khris Middleton, whose free throws brought the Bucks back within five before a lightning-fast catch-and-shoot Terry three closed the gap to just two. 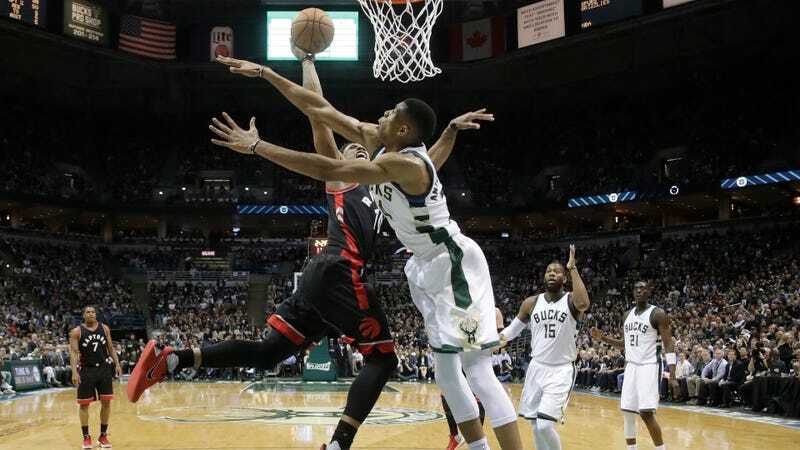 Alas, that was the last true moment of hope for the Bucks—after a make-and-miss set of foul shots for Toronto, Giannis Antetokounmpo took the ball with sixteen seconds to play and Milwaukee down by three. But he drained almost all of that time before driving to the rim, leaving the Bucks still down by one and the clock nearing zero. The Raptors will next play the Cavaliers, who have been resting since sweeping the Pacers last week. What In The Damn Hell Were The Hawks Doing?